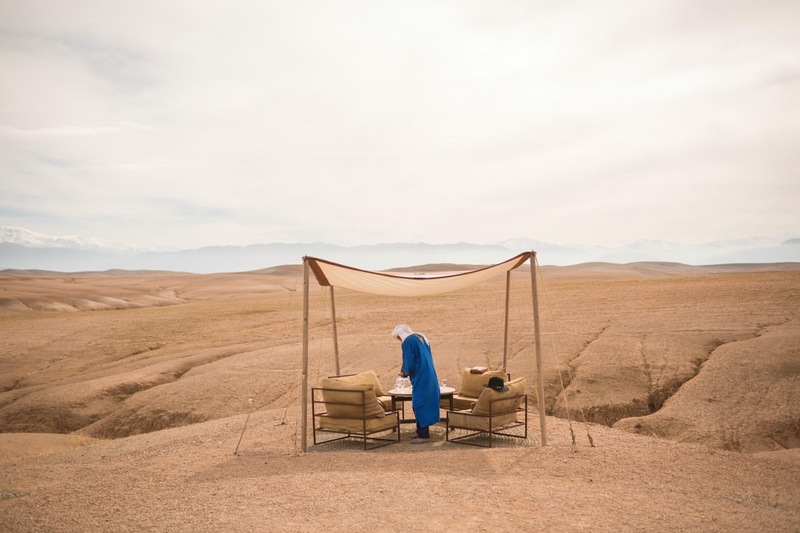 The elopement of Raquel and Miguel in the desert of Morocco was a magical one involving camels and a modern desert camp. We travelled for an hour from Marrakech to get to Inara Camp in the desert of Morocco for this shoot. The desert wasn’t your typical sandy desert but more grainy in texture. We arrived at the site and was greeted by the owner of Inara Camp where he showed us the facilities and introduced us to the local camp people who help to maintain the grounds. The camp was newly built and has all the modern facilities one would expect of any hotel. Every room was luxurious with stunning views of the mountains and desert landscape. We started the afternoon off with a traditional Moroccan meal of tagines, breads and soups – all washed down with some delicious local mint tea. Raquel and Miguel then proceeded to get ready whilst the local camp people helped bring the camel to the shoot spot. Raquel’s initial outfit was a beautiful Shikoba chiffon maxi skirt that created a wonderful silhouette against the wind and the fringing lended itself well to the Moroccan vibe. Miguel kept it simple and added braces to his outfit for a modern boyish look. As sunset started to set in, Miguel and I took a break drinking mint tea and admiring the wonderful stationary as Raquel was getting changed for her second outfit The stationary palette designed by Wonderland Invites was a mix of earth tones contrasted against purples and reds to compliment their Moroccan theme and there were even some tassles added to different pieces to add a touch of flair. The couple exchanged vows to each other under a simple rustic arch as the sun set – confirming their future as husband and wife in the simplest of settings but with all the love and deepset feelings of any newly-wed couple. They toasted their next step of life with some more mint tea (they simply can’t get enough of it!) before whispering all their heart’s desires and wishes into a sky lantern and setting it out into the night sky as the day came to an end. We warmed ourselves at the campfire before driving back to the hustle and bustle of Marakesh town centre and leaving the peaceful desert surroundings behind. Thank you for trusting me with capturing this moment.